Craig Newman / Guest reviewer for Sonic Cathedral speaks with Southern California’s female fronted metal band Edge of Paradise’s Maragarita Monet about upcoming music projects. 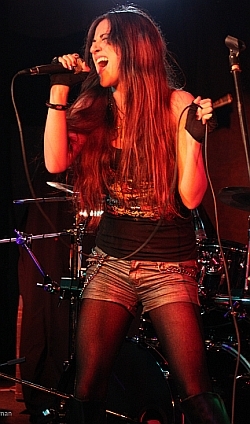 Margarita, who co-founded the band with guitarist Dave Bates during 2011 when they met while working on another music project. On their debut CD "Mask", Edge Of Paradise unleashed an aggressive, knockout punch of industrial heavy metal with other music veteran bassist, Tony Franklin and drummer, Gregg Bissonette. 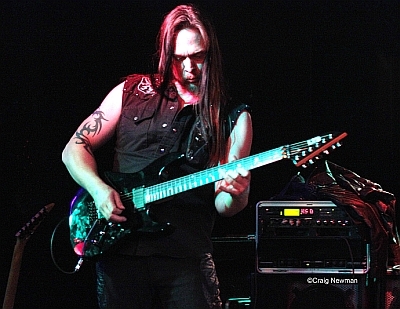 Craig Newman: Who are the current members of the Band? Margarita: Myself as vocalist and keyboards, Dave Bates on guitar, Kurt Sheaffer on bass, and Gene McEwen on drums, and also worked with Ryan Jones on drums. We have studio musicians and touring musicians, whoever can commit for touring. Like if we have forty shows we have players on deck. Craig Newman: Is there current info on your album? Margarita: Our debut album is called “MASK” that came out September 2011 and has nine tracks. Got to number on 41 almost top 40 on the loud chart (laughter). We are still promoting it and working on a new album with producer Michael Wagner. We have a new single coming out called “In A Dream” and more songs for the new album. Craig Newman: I saw the video for the cover of Motley Crue’s "Saint in Los Angeles". Who decided to do that? Margarita: It wasn’t our decision, we were contacted from Versailles records that put out compilations every month are now putting out a Motley Crue compilation and asked us to remake a song. And bands such as Quiet Riot are covering songs too. Craig Newman: Are there local shows planned for this year or next year? Margarita: We decided no local shows planned for Los Angeles. We are going to play at national festivals and our main concern is getting on a big tour as a supporting act. Our next gig is at Hawaii for a week; we are co-headlining at a music Halloween festival. Craig Newman: Is there is a release date for the new album? Margarita: What we want to do is release the single and two more songs from it because by the end of the year we can play them live. We will play them at the Hawaii show. We currently have only four songs. The whole album will be released during 2013. It takes a lot of money to make an album and we would rather put it toward touring. Craig Newman: Thanks for your time and look forward to hearing the new album and seeing you perform again next year.